We had such a wonderful stay at this beautiful quaint farmhouse. The view is spectacular, and the yard is a perfect place to sip wine as the sun is going down. I loved the feel of this home. 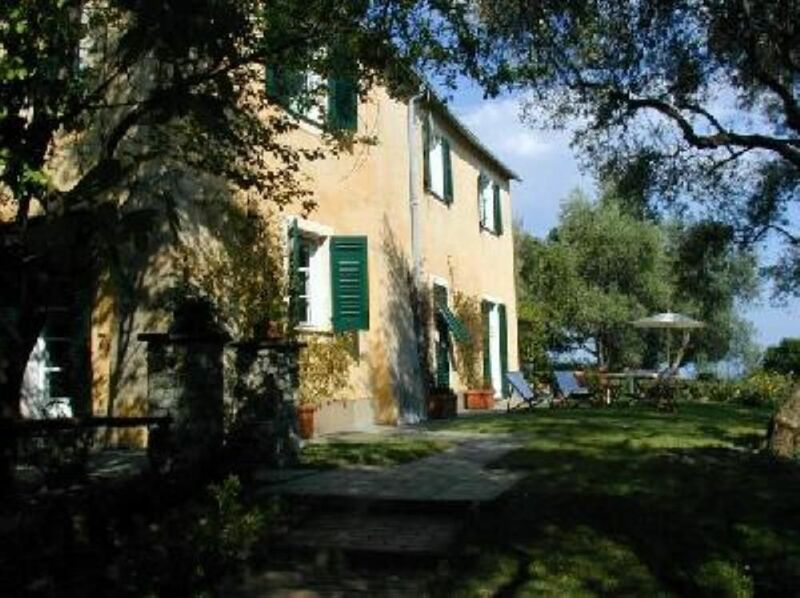 Although this home is very rustic, it is well maintained, and is an authentic italian experience. The walk to town and back is challenging from high atop the hill, but great exercise for those that are up to the task. A small car would be preferable, as the driveway is quite tight. I would highly recommend this property, would definitely come back again. Maria was so sweet and very helpful...thank you Maria for a wonderful stay! Spacious home with lovely grounds and gorgeous views. Great place for a family or two to relax. Very suitable for longer term rental. Maria and Vitale were extremely kind, welcoming and helpful. also for me ,you have been very welcome and y remember you very much, thankyou again ! We enjoyed our recent stay in Santa Margherita Ligure. The villa is very nice, with plenty of room for our party of 6 adults. The views from the backyard are spectacular. There is plenty of outdoor furniture to enjoy the yard as well. We were disappointed that the kitchen is inadequate. There were few useable cooking pans and no outdoor cooking or grilling. There are no pantry items at all, not even salt and pepper. The walk to town is an easy downhill trek. However, the walk back is a climb of over 350 uphill steps. Maria Bocciardo is very nice, however she does not speak English and is not able to communicate electronically. This caused major miscommunication. We agreed to meet Maria at the gate of the property. We arrived late due to a delay at the airport. We sent Maria several messages to keep her informed, yet received no replies. We tried to call her and got the same results. After waiting for over 2 hours at the gate with no response from Maria, we had to check into a hotel for the night. The next day we met Maria at the gate and she explained that she had waited at the villa for us the previous day. Why she did not check the gate or answer our calls and messages is still a mystery. Overall, we were happy with our stay, but be aware of potential pitfalls. We rate the property and our experience at 2.5 stars with much room for improvement, especially in the area of customer service. We would not recommend this property unless changes are made. senza poter comunicare in tempo reale? gli ospiti erano scesi con tutti i bagagli, visto che il Sig.Chapasko, li faceva attraversare, data la pericolosità del punto, glielo ho detto , non capivo perchè! io non so bene l'inglese ma da li a non poter comunicare ne passa! in cucina,c'è quello che serve, anche la saliera, non discuto altro, sono contenta perchè non torneranno! A beautiful villa with stunning views of Santa Margherita... Nice villa, great location! review, y yope to see you again with wifi acting! All the other reviews were spot on, it is a fantastic location, modestly furnished, restored farmhouse. Now I will say the short walk down into the center of town included 401 stairs but it was doable. The best part of the walk was it ended at Cafe Da Nello on the main street.Even if you do not like tuna just order their tuna steak. You will be amazed. The worst part was the 401 steps back after all the wine with dinner.The town center is quite happening at night especially with a soccer game on the big screens.Maria was especially helpful after I had a car accident (absolutely do not turn left out of the driveway) . She stayed with us for the 3 hours it took to do all the police reports. really many many tnanks for your review !!!! and for "Maria was wonderful", y dont know but y know y do that with pleasure ! We had a wonderful stay in this house. It is ideally located in the heights of Santa Margherita (very charming!) just 5 minutes by car. The same distance to Rapallo. It has beautiful views (specially from the upper floor rooms) and very quiet surroundings with a nice garden & barbecue area. The interior it's nice too, with a relaxed atmosphere and details of good taste. The owner was very kind and willing to help. We will definitely hope to come again!